The Flood Mitigation Assistance (FMA) program is authorized by Section 1366 of the National Flood Insurance Act of 1968, as amended, with the goal of reducing or eliminating claims under the National Flood Insurance Program (NFIP). FMA provides funding to States, Territories, federally-recognized tribes, and local communities for projects and planning that reduces or eliminates long-term risk of flood damage to structures insured under the NFIP. FMA Funding is appropriated by Congress annually and grants are awarded on a nationally competitive basis. Properties included in a project subapplication for FMA funding must be NFIP-insured at the time of the application submission and prior to the period of availability or application start date. 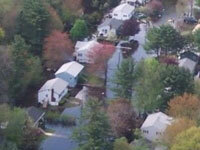 Flood Insurance must be maintained through completion of the mitigation activitiy and for the life of the structure. For more information about pre-disaster mitigation, visit our resource center or contact the State Hazard Mitigation Officer at 603-271-2231 or via email at HazardMitigationPlanning@dos.nh.gov.